Catalonia’s ‘solemn declaration’ – has the Rubicon been crossed? Two years back, I wondered if and when Catalonia would ‘cross the Rubicon’ and clearly position itself in contravention of Spanish law. Some sort of moment of illegality is essential in any process like this, just like during the Spanish Transition, to mark the break with one judicial and legal authority, and the beginning of a new one. Yesterday, the two pro-independence groups in the Catalan parliament, with a majority of seats but not quite of votes, signed an agreement to present a ‘solemn declaration’ to the parliament for ratification next Monday, officially declaring the start of the formation of a new Catalan republic. Among the nine points in the declaration, the parliament will vote to approve that the Catalan institutions are no longer subject to the Spanish Constitutional Court, a tribunal it declares to be ‘illegitimate’ since its ruling against Catalonia’s statute of autonomy in 2010. It was Mariano Rajoy, then leader of the opposition, who went around Spain collecting millions of signatures “contra los Catalanes”, in order to apply pressure to a Constitutional Court decision. The decision to hear the case against the Estatut, described by Javier Pérez Royo in 2007 as a ‘Coup d’Etât’, was effectively the beginning of the current independence process. And it’s Mariano Rajoy’s immovable position which has precipitated yesterday’s agreement. Rajoy has been planning for a moment of illegality for some time. Indeed, he thought he had one in last year’s 9N public consultation on independence, though that remains to be seen. This time, however, it looks more likely to stick. Which is why we had the uncharacteristically rapid response in the form of a televised statement, apparently agreed in advance with PSOE leader Pedro Sánchez. So is this a point of no return? It looks like it could well be. Rajoy will now have to decide whether he treats it as a meaningless statement – “provocative”, as he has already said, but meaningless all the same. Or whether he intends to take it seriously and respond just as seriously, by calling for sanctions of some sort against Catalonia. And what will happen if Rajoy does push to suspend autonomy? That would be a first in Spain’s current constitutional arrangement. And could it trigger a revolutionary situation in Catalonia? There are still many questions to answer. Firstly, congratulations for the European Parliament medal and everything. I’m not entirely sure why you were nominated. You don’t seem to have done anything. Except publish press releases and organize two or three sparsely attended demonstrations at which pretty much the only reliable will-shows were the boot boys from Democracia Nacional and Plataforma per Catalunya. Still, it’s not for me to explain the workings of the European Parliament, and I won’t ask you to either. But I do have a question or two for you. They’re about one of your founding members. No, not Josep Ramon Bosch. I couldn’t care less if the alleged highlight of his Dad’s year was organizing a mass in honor of General Franco. The sins of the father, etc. No, I’m more interested in Javier Barraycoa, listed as a founding member on Wikipedia. He is, apparently, also the secretary of the Catalan section of the Carlist party ‘Comunión Tradicionalista Carlista’, a party dedicated to ‘God, Fatherland, Charters and King’. CTC promotes a sort of ‘organic democracy’, (known by pretty much everyone else as ‘authoritarian democracy’), generally considered to be a key component of Mussolini and Stalin’s respective brands of totalitarian dictatorship. He’s on the record as saying that he “doesn’t believe in elections”. Question 1: Is Javier Barraycoa a member or official of SCC? I ask because a search of your organization’s website shows no sign that he has any connection with you. But at the same time, I can’t find any press stories detailing his expulsion from SCC. So I have to ask. You understand. Question 2: Do the values of Carlism fit with the values of the SCC? Question 3: Did you never worry that linking your so-called ‘plural’ organization with someone from Spain’s traditionalist far right wing could look bad? Is that perhaps why his name doesn’t appear on your website? Question 4: As proud members of a plural Catalan and Spanish society and defenders of democracy, do you as an organization condemn the military rebellion of 1936 and the dictatorship it led to? I look forward to your responses! Have a great week! Fellow traveler Kate Shea Baird sums it all up quite well. I feel it’s important for those of us on the left who support Catalan independence to remember that we want independence in order to deliver a better country. Not just any country. An independent Catalonia, sí o sí, is not the aim and never should be. I don’t consider Catalans to be living under a repressive regime (unless you mean the Mossos) and so I don’t buy the liberation trope. And while I wouldn’t like to see Artur Mas behind bars for organizing the consulta, I’d crack the cava open if he and the rest of his party were sent down for corruption. The pro-independence left (mainly the CUP and elements of Iniciativa and a handful of people at ERC) must maintain its focus through all the twists and turns in this process. We must, above all, fight for our values as the keystone of our support for independence: we want a better country. We want a country that helps the poorest, defends labor, looks after its citizens’ health, educates its young people, invests in the arts and culture, promotes sustainable living and tourism, and rejects CiU’s corruption and the neo-liberal model. And because we’re on the left, we must want all these things for Spain as well. That’s the Catalan republic that I defend. So Juanca has finally abdicated, official immediately. It was a ‘surprise’ announcement which shouldn’t really have surprised us at all. The timing was obvious: a week after the EU elections, so as not to get people thinking too hard about how they want to be governed. This would have been agreed by the twin pillars of a crumbling political system: the PP and the PSOE. This is the key gesture launching a process which will attempt to preserve the status quo against serious threats including the royal family’s declining popularity, the failure of the bipartisan political system and the Catalan independence movement. The plan is probably to have a quick succession, coronation and then a series of constitutional changes ‘proposed by the new king’ in order to reduce the increasing discontent across the country. I’m not sure that they haven’t left it too long. Has no one told Rajoy that he should be next? PP u-turn to offer Catalonia a new fiscal pact – what now? It looks likely that next week will see Mariano Rajoy offer Catalonia a new fiscal settlement in an effort to deflate growing support for independence. This would represent a huge policy shift for the PP, which until now has refused to discuss any possibility of changes to how much tax revenue Catalonia receives from central government. The aim behind this offer is obvious and it underlines the serious strategic mistake the Spanish government has made in dealing with Catalonia. Refusal to negotiate since 2012’s September 11th demonstration has fostered significant unity and growth in the pro-independence camp. The PP effectively killed off any chance of returning to the days of ‘la puta i la ramoneta‘ – the traditional model that CiU has used to get more cash from Madrid by pretending to be pro-independence. This shift aims to reintroduce a ‘third way’, with the intention of undermining Unió support for Artur Mas pressing on with plans for an unlikely referendum this November. The question is, how successful will this manoeuvre turn out to be? Independentists will insist that Mas takes ‘ni un pas enrere’. Popular support for a referendum is around 80%. Can the PP really deflate this to acceptably low proportions? The fairest way to judge this would be to include any such offer as a third way in a consultative referendum which includes independence as an option. But the offer will almost certainly be linked to dropping plans for the ‘consulta’. I’m not certain but I get the feeling that the PP has left it too long to change its mind. Artur Mas’s constituency has shifted significantly and he knows it. I say this because I don’t see Mas as the evil genius mastermind behind the independence movement which seems to be an indispensable position for anyone who seriously doubts the level of popular support for independence here. I think he’s an opportunist who has hitched his wagon to the estelada. The Spanish government is clearly hoping that Mas will see sense and unhitch that wagon. Or at the very least, that Mas won’t be able to swan around complaining that Madrid won’t talk. As in any political decision, of key importance here is the personal ambition of those involved. I find it difficult to believe that Mas will back down now. And populist that he is, he’ll be thinking hard about his changed constituency and his legacy. As you’ll have heard by now. A referendum on Catalan independence “will be held” on November 9 2014. It will consist of two questions: “Should Catalonia be a state? And if so, should it be an independent state?”. CiU, ERC, ICV-EUiA and CUP agreed these terms. This represents a plurality of the parties in the Catalan parliament. The agreement came days before the potential collapse of the CiU government over a budget vote due next week. The response from Rajoy was immediate: “It’s not negotiable. It won’t happen”. Jordi Cañas of C’s (such a fitting name) maybe hinted at the unionist approach on TV3 just now: “There won’t be a referendum in November next year” he said, “there will be elections”. And as suggested here before, this is the most likely strategy of Spanish opposition to Catalan independence: deny the right to a referendum and thereby encourage the ‘other path to independence’ – elections followed by a unilateral declaration of independence. This would put Madrid in a much better position in terms of international support and negotiating power. It is, I reckon, the preferred outcome in Madrid because of how easy it would be to paint the Catalans as thoroughly antidemocratic, as well as sowing disagreement between the pro-referendum parties (Iniciativa won’t agree to a UDI as an election pledge, I shouldn’t think). So, in short: this time next year, we’ll still be talking about what might happen. Where is Catalonia’s Rubicon on the road to independence? So the gradual creep towards independence continues in Catalonia. A referendum remains highly unlikely as the only remote possibility of one being held is it being approved in the Congreso in Madrid, which won’t happen because the PP has an absolute majority (and anyway, the PSOE is in total disarray, and so can’t be relied on, except to be unreliable). Duran i Lleida – ‘king troll’ – warns frequently of the risks and possibilities of a unilateral declaration of independence. CiU is trying to slow the process, probably at least partly so it can carry on privatising everything in Catalonia, and ERC is chomping at the bit. All of this has me thinking: if we know, more or less, that a referendum cannot be legally held (the Catalan parliament will pass a law allowing it but this is understood to not be within an autonomous region’s capacities), then maybe we start to see the Spanish strategy. They want to force Catalonia into acting illegally if they want to proceed towards independence. The question is: is Artur Mas really willing to take this step? And if he is, when will it come? For Mas, I imagine it must be tempting. If everything went according to plan, he’d be remembered by Catalans for taking a stand, not for corruption and the destruction of Catalonia’s social services. He’d be like a new Jordi Pujol! On the other hand, if there’s an expert at saving his own skin, it’s Artur Mas. We can be sure that some of the time he spends drumming up contracts on foreign visits is dedicated to establishing Artur Mas as a Reasonable Man in the eyes of foreign officials. In the end, Catalonia’s Rubicon has two potential locations: an illegal referendum or a unilateral declaration of independence (UDI). If Catalonia attempts to hold a referendum without Spain’s permission, the vote will not be accepted as legal by the Spanish government. This would probably damage the potential turnout, currently reckoned to be really large. I can’t see Madrid suddenly agreeing to a referendum. But would it act to prevent one? It’s difficult to say. Spain’s already pretty unpopular in the EU, and preventing a referendum from being held, even though it would be an internal, legal issue, wouldn’t look good. But that probably wouldn’t be enough to stop Spain from intervening. I expect that if Catalonia says it will hold a referendum, the Spanish authorities will warn that to proceed would lead to grave legal consequences. I also suspect that if Catalonia insisted, Madrid would find itself under enormous pressure to intervene. In the end, I’m not sure that a referendum will ever be held. I think it’s much more likely that fresh elections will be held with a UDI as the deciding factor. If this happens, expect ERC to win, CiU to drop, C’s to rise, ICV to remain more or less in place, and the CUP to see a rise. The PSC and PPC will both decline even further. But a UDI is also illegal and far more so than a referendum. Surely Spain would have to act against a UDI, but how? Suspending Catalonia’s autonomy? Arresting the president and govern? I’ve always been against UDIs because while I agree that sovereignty resides in the people, not in the Spanish crown, I feel that international support will be difficult to obtain without a clear, free and fair referendum. If Spain blocks a referendum, then, it is of prime importance for Catalonia to make clear that it has exhausted the legal possibilities open to it. International opinion will be vital and, while not exactly popular, Spain has far more clout in that area than Catalonia does. 2014 might still be an interesting year. The most recent allegations made in the PP corruption case, first over last weekend in El Mundo and today in court, have been explosive. Luís Bárcenas, having denied that he wrote the alleged ‘B accounting’ books of the PP, today admitted that they were his work. He deposited digital copies of – apparently – all the documents related to the case with the judge. He went on to claim that Rajoy and party secretary Maria Dolores de Cospedal did receive cash payments from his slush fund in 2008, 2009 and 2010, totalling €90,000. Rajoy, in a dodgy press conference tactic, took a question from the friendly ABC newspaper instead of from El Mundo, and read a prepared statement. He won’t resign. Of course he won’t. And nobody was expecting that he would. But the PSOE has again called for his immediate resignation. They’re also trying to get enough cross-party support for a censure motion against Rajoy in parliament. I can’t see how this would achieve anything but a symbolic defeat because the PP has an absolute majority. If Rajoy has one political instinct, it is to ignore everything and carry on regardless. 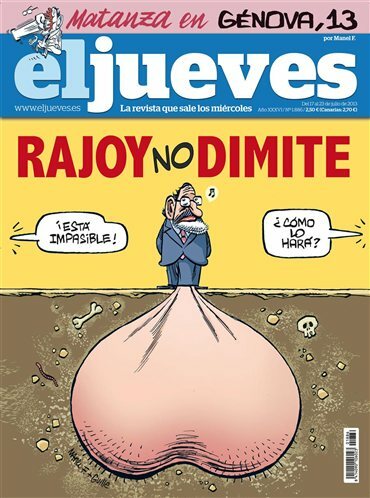 While often seen as burying his head in the sand, El Jueves had a better metaphor for the man today. But stepping back from the excitement of what seem to be such clear grounds for Rajoy’s resignation, we’re faced with two problems. The first is the source of all this information: Luís Bárcenas. The problem with him is that he’s clearly – evidently – a very dishonest man. So why should we trust him now when half of what he denied previously he now admits? The same goes for El Mundo and its crusading editor, Pedro J. Ramírez. El Mundo has a decent reputation for exposing some big corruption cases. But Pedro J.R. is a PP sectarian who loathes Rajoy. He also pushed bizarre conspiracy theories about the 11M bombings for years, and backed them up with some alleged documentary evidence. So should we trust Bárcenas and El Mundo this time? Well, the question is whether we trust the documentary evidence that Bárcenas has apparently submitted to the court today. He now says it is a full secondary accounting system which he maintained (why? self preservation?) as he handed over millions of Euros in unregistered donations to party officials over 20 years. Trusting this evidence is key. So why do I? Well, because two PP officials have already admitted to receiving these ‘extra payments’. Eugenio Nasarre and Pío García Escudero both made this admission in May. To now say that the documents that Bárcenas has produced are false would suggest a conspiracy at a much higher level, including various PP officials in an incredibly elaborate anti-Rajoy plot. No, the more believable version is that Bárcenas, realising he has no protection whatsoever from the party he gave so many years to, has decided to sink them all. And this leads us to the second problem. Assuming we do trust the ledger books, what other corroborating evidence is there? It will be easy for Rajoy, Cospedal et al to insist that whatever the court says, the documents are false. They could string this case out for decades. So we need some evidence other than the ledgers and it’s still not clear that Bárcenas has this. The PP has talked about releasing tax statements for all its MPs to prove their immaculate record. This, naturally, is insulting. If they want us to believe that their tax records prove that they didn’t get envelopes full of cash, they’re sorely mistaken. So this is where we are: what seems to be clear incrimination for the head of Spain’s government, and no solution in sight. We can only hope that Bárcenas has something else hidden under his blanket. Artur Mas has been on an official visit to France. He celebrated that Spain has permitted Catalonia its own sub-representation at UNESCO in Paris. He also took the opportunity to suggest that the concession for Rodalies commuter trains in Barcelona might be sold to SNCF when Renfe’s license expires in 2015. Similar noises were made a while back when it was suggested that France be the defender of Catalan independence and territory, rather than Spain or Catalonia itself. A proposed meeting with the French minister of defence was cancelled – allegedly after pressure from Spain. So it’s privatisation of public infrastructure, but done in a clever way that in theory could help get the French on-side when it comes to independence (and thus make us forget that we’re talking about basic state services). Going further down that road could be risky: an independent state with no infrastructure to call its own isn’t much of a state. Can Rajoy survive the Bárcenas case? I’ve been meaning to write about the political corruption cases rocking CiU and the PP over the last few weeks, but every time I start an article, a new case appears. Since Gürtel, we’ve had (to name a few) Palau, Sabadell, Lloret… and Bárcenas. All the cases are serious but Bárcenas is the big daddy of corruption scandals. It’s is a case which could – and should – bring down the government. Originally linked with Gürtel, the Bárcenas case involves significant cash payments made on a monthly basis to senior members of the PP by its then treasurer, Luis Bárcenas. The money, mainly party donations and kickbacks, was handed out in envelopes. This went on for about 25 years until it suddenly stopped a few years ago, apparently on Mariano Rajoy’s orders. Bárcenas also benefited from the tax amnesty which was one of Rajoy’s first policies. He managed to legalize millions of Euros kept previously in Swiss bank accounts. What’s stunning about this case is that firstly, this isn’t mere anonymous claims made in El Mundo. It’s stuff that Bárcenas and his legal team seems to be admitting to. Secondly, Mariano Rajoy himself allegedly received €25,000 a year for 11 years in dodgy money. And this may have gone on until 2009. With a spring and summer of protests on the way, I’m starting to wonder if Rajoy’s government can survive. If it does, it will be through our failure to act as citizens and residents of this corrupt country.